"A. Davis Burial Site, Burial 2, 2003.08.1213" by Timothy K. Perttula and Robert Z. Selden Jr.
DECORATION (INCLUDING MOTIF AND ELEMENTS WHEN APPARENT): The central elements of the motif are engraved diamonds repeated four times around the vessel. The diamonds have a central interior diamond. The diamonds are the central element in connected horizontal scrolls. There are rows of excised pendant triangles under the vessel lip and at the carination. There is also a single horizontal engraved line on the interior vessel surface at the carination. Ripley Engraved, var. 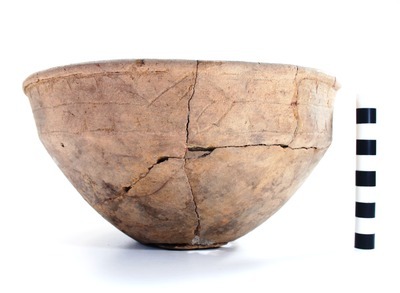 McKinney carinated bowl, Burial 2, A. Davis site.